There are several different treatments for an overactive thyroid. These include medicines, radioactive iodine (also called radioiodine), and surgery. Talk to your doctor about which would be best for you. 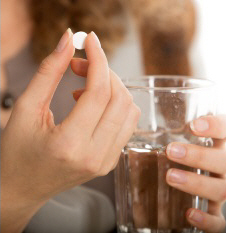 The most common medicine used to treat an overactive thyroid is called carbimazole. This medicine can help to decrease the level of hormones your thyroid makes. You need to take it for 12 to 18 months to control an overactive thyroid. About half of people can stop taking it after this time, while the other half need to take it long-term. If you need to keep taking it long-term but are worried about doing so, talk to your doctor about trying another treatment, such as radioiodine or surgery. Carbimazole can cause a problem with your white blood cells (your immune system), but this is rare. If you get a sore throat, fever, or mouth ulcers, or if you feel like you have the flu, stop taking the medicine and see your doctor for a blood test urgently. You might also get a medicine called a beta blocker, like propranolol. This doesn't affect your thyroid, but helps with some of the symptoms, such as the shakes (tremor), racing heart (palpitations), and nervousness. In radioiodine treatment you drink or take a capsule of iodine that has been made radioactive. This shrinks your thyroid and stops it being overactive. You can read more information about Radioiodine treatment for thyrotoxicosis. Sometimes people need surgery to remove part or all of their overactive thyroid. Surgery can help, particularly if you have a very large thyroid or if other treatments haven't worked. It usually involves a few days in hospital. Thyroid surgery is generally very safe, but can have some side-effects, such as affecting your calcium balance or damaging your vocal cords. Talk to your surgeon about the pros and cons before surgery. After any of these treatments, it is quite common for your thyroid to become underactive, meaning it does not produce enough hormones. This is called hypothyroidism. It's easy to treat hypothyroidism with hormone tablets that you take every day to replace the hormones your body isn't producing. Information about the causes and treatment of an overactive thyroid.